The last winter lecture will be by an old friend - and member - of HADAS, Paul Craddock. His title is Early Mining and Metallurgy from its inception to the Bronze Age. Mr Craddock, who used to live in our area but has now loved to Kent, works in the British Museum Research Labora­tory, in charge of metallurgical investigations generally. His lecture will give a rapid survey of the first 8000 years of metallurgy, concentrating on mining and extractive processes, with specific examples from Bronze Age copper smelting sites in Israel, Iron Age and Roman silver smelting at Rio Tinto, Spain, and medieval zinc distillation in India. Some of the new research techniques developed at the B M Research Laboratory will also be described, and the policy of collecting ancient smelting debris to form a world-wide study collection. Wed. May 18. (Please note: not May 11, as on your programme card) is the Society's AGM. Further details in the May Newsletter. Both the above meetings take place at 8 pm for 8.30 at Central Library, The Burroughs, Hendon NW4. Sun. May 15 (afternoon).The proposed route for our conducted walk in the City of London will cover the fine stretch of Roman Wall at Coopers Row, visit to the remains of the Mithras temple and another stretch of wall at St Alphage and Barbican. We hope to see the corner of the Roman fort at Noble Street and visit the West Gate site which will be opened for us, ending at the Museum of London with time to visit the galleries or to have tea. If you wish to join this tour please let Dorothy Newbury (203 0950) know as soon as possible, as approximate numbers are required. Full details in the May Newsletter. The exploration of Deans Brook continues and we have now walked the brook northwards as far as Stoneyfield Park. The stretch from Brookfield Avenue to Hale Lane is almost entirely constrained and the bed has been concreted. From a point about 50 yards north of Male Lane to the south boundary of John Groom's Crippleage the stream became too deep for wading and tile banks proved inaccessible, but we were again able, to follow its course northwards alongside the Crippleage grounds and beyond Edgware Way into Stoneyfields Park. In this area the stream again flows over natural gravels and its east bank is for the most part unconstrained. Within the small park the stream is very convoluted, and it is now showing signs of cutting itself a new channel by eroding the narrow necks of lands between its meanders. This area might repay further watching. FROM THE ROMAN GROUP. A guided tour of Colchester Museum has been arranged for Sat. June 11, at 2 pm, to include a talk and slides of special interest to Roman enthusiasts. The museum has limited us to 15 members only, so if you are keen to come, contact Tessa Smith (958 9159) without delay to arrange times and transport. Former carpark, Elmhurst Crescent, .N2 . Any members who notice signs of development activity on these sites (and it may not be for some time) are asked to let Elizabeth Sanderson (950 3106) know. The Prehistoric Society's spring conference at the Museum of London on March 19/20 was on the prehistoric wetlands of Europe. Speakers came from Denmark, the Netherlands, North Germany, Italy, France, Switzerland and Ireland, as well as four from Britain. It was one of the most varied and interesting conferences the Society -has sponsored and the ten or so HADAS members who attended had a feast. Almost every paper was memorable, which makes it tricky to choose what, in this short space, to report. Perhaps the deepest impression made by the conference as a whole was the importance of these wetland sites for filling in gaps in know­ledge left by dry sites, It is only when you study the wetland that you begin to appreciate the tremendous importance of organic materials like wood. ii providing early peoples with the artefacts of everyday life. Indeed, a Danish paper on .a submerged Ertebolle site with aft occupation sequence from 4000-2200.BC suggested that we should perhaps, on wetland evidence, consider re-naming the later stone ages The Wood Ago. Another great gap filled by wetland sites is what our Mesolithic to Iron Age ancestors ate. There was hardly a paper that did not list evidence, far fuller than most dryland sites can provide, of remains of animals (domestic and hunted), fish, birds and plants (cultivated and gathered). This ranged from the pointed-base pot, half full of fish bones (suggested as the residue of a Mesolithic bouillabaisse), to the 25 stone of hazelnut shells from Seamar Carr in Yorkshire and the flat loaves and recognisable apple halves from a submerged Neolithic village with a 2500 BC radio carbon dating near Grenoble in France. It was all enough to make you long for a nice stretch of ancient wetland to explore in the London Borough of Barnet. The Prehistoric Society, incidentally, is excellent value both for amateurs and professionals. The Proceedings alone - anything up to 500 pages annually - are worth the £10 subscription, and additional perks include monthly lectures, plus the right to attend an annual spring conference and a week's summer meeting, held in regional centres such as Dublin, Exeter or Orkney. Some membership changes have taken place recently in the Committee ­one to rejoice in, others greatly to regret. Taking the good news first, we warmly welcome a new junior representative, Kate Balen of North London Collegiate School. There has been no one to speak on the Committee for young-members since Bryan Hackett had to resign last May - so Kate's presence is much appreciated. In fact, there are always places for two junior members on the Committee. If anyone else among the under-18s feels moved to join, please let the Hon. Secretary, Brian Wrigley, know on 959 5982. The sad news is that two members have resigned from the Committee (though not, we are glad to say, from the Society). One is Ken Vause, a stalwart in HADAS's team of photographers. He has been a committee member for the last three years. The other is one of our senior members, George Ingram. George joined HADAS 10 years ago and within a year came onto the Committee as Hon. Librarian. Now he says "my sight is becoming a bit dim, so committee work isn't on. Tell everyone I'm keeping going though, and making the best of it." Everyone, we are sure, will learn of George's eye problems with real sorrow. We shall certainly miss his cheery presence on Committee, and hope to continue seeing him - and Ken - at other HADAS events. The Committee has had several reports on the Society's new field groups, described by convener Elizabeth Sanderson in the last Newsletter. The object of each group is to keep a close watch on events in its immediate locality which might have archaeological repercussions. Albert Dean, who heads the Burnt Oak group, has produced a form for members who go site-watching to fill in. It covers such points as where the site is (grid reference as well as address); archaeological details of trenches observed - length, depth, position on site and what, if anything, could be Seen in the sections; name of contact on site (developer, builder, etc) and type of access; what is to be built there and what was there originally. It is hoped to continue publishing in the Newsletter - as we have done .in the past - brief reports on site-watching. Regular publication of such information from various parts of the Borough, no matter how brief nor how negative the evidence, will gradually build up a picture of what has been observed which could be invaluable in the future. Members who would like to join a local field group should get in touch first with Elizabeth Sanderson (950 3106). The Committee has approved a report from a small working party on excavation policy, which states that it is highly desirable for the Society to mount at least one dig each year; and that at present no site in the Borough is known to be in urgent need of rescue. The working party suggested six sites on which, given various provisos, trial trenches or perhaps more extensive excavation might to possible. First site on the list was the Hadley Common earthwork, which is the subject of a further note later in this Newsletter. Ann Trewick was warmly thanked by the Committee for putting up an exhibition of photographs and finds on last year's dig behind the Old Bull. The display is at the Old Bull, High Street, Chipping Barnet until just before Easter. The excellent photographs are the work of HLDAS member Eric Ward. The Borough Librarian has written to the Committee about the Moxom collection of Roman pottery from Brockley Hill. He hopes to put this on regular display in one of the downstairs rooms at Church Farm House Museum. Most members have probably heard the sad news that our ex-Treasurer, Jeremy Clynes, has been literally laid low for the last 6 weeks. On almost the only frozen morning of this winter he was proceeding along Hoop Lane towards Golders Green station at his usual brisk trot when a piece of ice intervened and he landed - not at all gently on one hip. Since then he's been under traction in the Royal Free, and remarkably philosophies about it, too. Good news is that the traction should be over by the time you read this - and then in his own graphic words "they'll have to dig various bits of metal out of me and after that I shall have to go vertical - and that's said to be quite shattering after 6 weeks lying flat." When he leaves hospital hopefully at the end of March - it may be crutches for a bit: but it's. nice to report that the worst is clearly over and Jeremy will soon have his feet firmly on the ground again. The Society has been successful this year in obtaining a Lloyds Bank grant to buy a prismatic compass (it may stretch to two!) We hope to make a survey of the earthwork in Hadley Wood and to do so adequately necessitates the use of such a compass. Frequent strollers in the wood may well enquire "what earthwork?" This is, indeed, partly the point. The remaining surface traces of bank and ditch are slight, hard to find and well worth recording before they become further eroded, in a manner which can be plotted on the large-scale OS. Sheet. The earthwork has, it seems, been known since 1913; it is recorded by the Museum of London as an Iron Age hillfort. I have not yet been able to get hold of the earliest report in the LAMAS Transactions for 1920; it would be interesting to know on what evidence the identifica­tion of it as Iron Age is based. Alec Gouldsmitht Victor Jones and I recently looked at it (and with­out Alec's intimate. knowledge, would never have found it!) and sketched part of it. We hope to complete a proper scale survey by prismatic com­pass - the only means possible in the tangled growth in April. When this has been done it may well give a lead to the best approach for fur­ther investigation such as soil surveying, trial trenching, phosphate testing - to try to confirm its date and (dare one say?) even to suggest its purpose. Should a dig seem desirable, we have high hopes that the Curators of the Common, one of whom is HADAS member Andrew Pares, may look kindly on the scheme. Sat. Apr. 16 from 11 am. LAMAS Conference of London Archaeologists, at which Ted Sammes will be speaking on the HADAS Church Terrace dig of 1973. Summer Courses. Butser Ancient Farm will run 6 residential courses this summer, each of 5 days and limited to 10 students, who will take part in the general and specific research projects of the farm. These include prehistoric farming techniques, pottery manufacture, smelting of metals. and prospecting methods and devices (including magnetic susceptibility and phosphate analysis). Cost per course is £59.50, which covers board, tuition and equipment. Further details, including dates of courses from Brigid Grafton Green, 455-9040. Our colleagues in the Camden History Society ask us to give details of their forthcoming meetings, which we are glad to do. They are at 7 pm at Holborn Library Hall: Apr. 14, Hugh Meller: London's Cemeteries; May 12, Mrs Ferrugia History of the Post Office. We were favoured at this meeting by the visit of Miss Vivienne Constantinides (daughter of our founder) who showed magnificent slides of Egypt and talked as if we were all old friends - as, indeed, we felt. She got off to a flying start by running through ten or so slides from Hendon days. Half a dozen were of HADAS's very first dig, in 1961 at Church End Farm. There were few faces that today's members could recognise among the diggers - and those there were looked quite remarkably young: Ian Robertson, who directed that dig and was just going up to Oxford; Mr Wookey, studying a hole in the ground with nicely combined zeal and knowledgability; and Liz Sagues - then Elizabeth Watkins ­looking positively dazzling in brief emerald shorts and a lovely length of leg. These slides, plus others taken in Hendon in 1960, were presented to HADAS at the end the evening - a much appreciated addition to our collection, particularly as Miss "Constans" both 21 years ago and now, is clearly a master of the camera where slides are concerned. Then it was on to the main business of the evening - our trip down the Nile, bordered here by cotton fields and date palms, there by funerary temples and majestic ruins. From Cairo to Mephis to Luxor we wandered, through modern mosques with wonderfully precise geometric decoration and ancient tombs whose walls were alive with the painted peoples of the past. The tiny figures of tourists made the huge carved and painted re­presentations of priest and Pharaoh seem even larger; and the expertise which had made them even more marvelous. The construction, in mudbrick or stone, of ramparts and pyramids of huge size suggested that early Egyptian man possessed skill and patience we no longer have. No sooner had that thought come to mind, however, than a slide of the Aswan Dam, a triumph of Modern technology, got things into perspective again. We have our moments, too - and the saving of the Aswan temples was one of them. This visit by Miss Constantinides made a fitting end to a splendid anniversary year. 2 by small quantities of pottery found on the two sites (b). Of two sherds found on the Church Terrace site the excavator writes “It is interesting to note that both these types of vessel have associations with religious beliefs” (c). Other chance finds listed in the roundup are too scattered to allow sensible interpretation, with the exception of the cremation urn found in Hendon; Roman graves (other than infant burials) were commonly situated beside a 3 road. The Viatores in 'Roman Roads in the South East Midlands (d) suggested that three roads passed through, or beside, the Borough: Watling St on the western boundary, Route 167 from Arkley to Hampstead on its way from Verulamium to Londinium, and Route 220 from Stevenage on the eastern boundary. Watling St (Edgware Rd), long acknowledged as a Roman road on evidence elsewhere, is not included in the present investigation; metall­ing has been observed during excavations at Brockley Hill, and HADAS maintains a watching brief on the part within the Borough whenever road or building operations allow. Route 167 is more doubtful, the last firm evidence being a section at Well End, just north of the Borough; Route 220 is also doubtful. Evidence for these two roads has been the subject of this investigation. 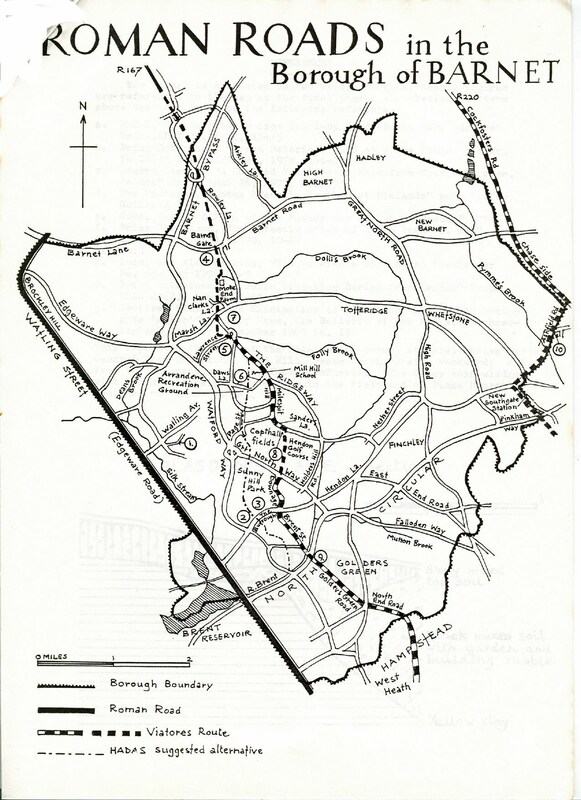 The study has included 10 walks between 23.8.80 and 20.2.82 along all the footpaths which might lie on a Roman road, and on some of the roads where evidence might be visible; three other investigations were made, including a trial dig and the use of an augur; aerial photographs have been studied, and documentary research has been carried out, mainly study of early maps. No positive evidence for these two roads has been found, and the signs of agger and metalling reported by the Viatores were not now found to be visible (p. 121-2 and maps on p.390-391). 7 called Mote End Farm) and across Nan Clark's Lane to Highwood Hill. This is an old footpath (appearing on Crow's map of 1754) (e) and it crosses the Totteridge Mote Mount ridge at Mote End Farm, about 200m W of its highest point, 145m. The various stretches of agger and metalling sighted by the Viatores 20 years earlier did not appear to the present investigators to be visible, although there were features lying on either side of Nan Clark's Lane, in private property, which might merit further investigation. 4 The possible agger and ditch in Field 7083 was examined later after plough¬ing, but no clear evidence of metalling had been turned up. 6 point, again 125m by Wills Grove at the top of Milespit Hill. From there it must descend to cross the low lying Copthall Fields before ascending the higher ground at Hendon. Alternative ways between Highwood and Hol­combe Hills have been considered in this study, and the route favoured by the Viatores down Milespit Hill (previously Dole St), across Copthall Fields and to Brent St via Downage, and thence to Golders Green and Hamp­stead, has been compared with the possible alternative from Wills Grove by the footpath across Mill Hill School playing fields, Arrandene open space, Page St and the footpaths through Copthall Fields and Sunny Hill Park, past St Mary's parish church, continuing by footpaths now mostly enclosed between houses and gardens to the river Brent. trenches wore dug in the Lawrence St allotments, all with negative results. 5 directly under the modern road and straight up Holcombe Hill by the Old Forge. 8 Lane, uncovered two sections of metalled road, 650 ft apart, dated by Romano-British pottery to 50-100 AD. Although the general orientation of those two sections was S, .the northern piece was orientated NNE/SSW while the southern. piece was NNW/SSE, suggesting that the road made an obtuse bend at a point between the two sections, continuing across the golf course on a line supported by reported sightings of metalling at.TQ233911. During the present investigation Ashley Lane was examined for signs of this projected road, particularly for evidence for the bridge of the field name on Crow's map, but with no result. At the southern end of Brent St, in a garden abutting on the W side of the modern road; where a piece of glass and a sherd which could be Roman had been found, two small trial holes were dug to a depth of 40-60 cm.' A layer of cobble and pebbles in clay were found at this level. This could be a road surface, but there was no dating evidence, and early maps show houses at this point. 9 Father south previous excavations (h) have failed to demonstrate a Roman road. 3 at 111 Sunny Gardens Rd (i), a distance of about 150m, and it passes close to the possible Roman settlement near St Mary's Church. From the church this route follows a further line of footpaths to the river Brent, passing by two fields on Crow's map called 'Great Footpath Field 789' and 'Little Footpath Field 702'. Its subsequent route is quite uncertain. These footpaths were walked from the Ridgeway to the Brent, but no additional information was obtained. The case for this route is no more certain. No section of it had been cut at any point by the Viatores, but they quote considerable docu­mentary evidence for an early road leaving Londinium at Cripplegate, the gate of the Roman fort, and continuing by an old bridleway E of Islington over Highbury Hill, the first high ground north of the city. They admit doubt as to the line of the road for the next 5 miles to Southgate, but claim that vestiges are to be found further north. There is more evidence of occupation along the whole route than there is along 167 (including tombstones and other burials, a farm site and much pottery, coins, etc), but none of it in the Borough of Barnet. The Viatores publish a photograph (Plate X) of the agger seen at Muswell Hill golf course. 10 The present investigation studied the proposed route between Pinkham Way and New Southgate station along the Borough boundary. No evidence for the road was visible. Between Blagden's Lane and Ashfield Rd, where the Viatores had found pronounced agger, Geoffrey Gillam (j) reported examination of a partial section across the supposed agger when building operations cut into the bank for 150-200ft, from the centre to the western edge. There was no sign of-metalling; he suggested the agger was no more than the county boundary bank, possibly increased in height and reinforced with rubble to improve the footpath. The opportunity to examine the east side of the bank at Blagden's Lane was offered by kind invitation of Mr Vandervell. A trial trench was dug in his garden at The Oaks in November 1982. A 2m x lm trench was dug at right angles to Blagden's Lane which runs NNE across the front of The Oaks, TQ 296938. It was dug as close as possible to the fence between the Lane and the narrow strip of garden lying S of the house; the trench was situated approximately at the centre of this fence and at right angles to it. It was dug to a depth of 45cm, and a further 45cm was augured. Findings nearest the fence, about l0cm of stony topsoil lay above yellow clay containing little stone and no artefacts. 30cm from the fence the yellow clay profile began to slope down­wards forming the edge of a ditch filled with a black mixed soil contain­ing garden and building rubbish, and a large proportion of pebbles; The eastern edge of the ditch was not determined.. Auguring showed a continu­ation of the yellow clay (see illustration). These findings confirm Mr Gillam's conclusion that this bank is probably the boundary bank; There was no evidence of a metalled surface. In conclusion, it is apparent that while this investigation of the sections of the Viatores Routes 167 & 220, lying within or on the boundary of the Borough of Barnet, has reported only negative results, none is conclusive, with the exception of this last piece of Route 220. The alter­native routes of 167 are still open to re-examination in the light of new information. 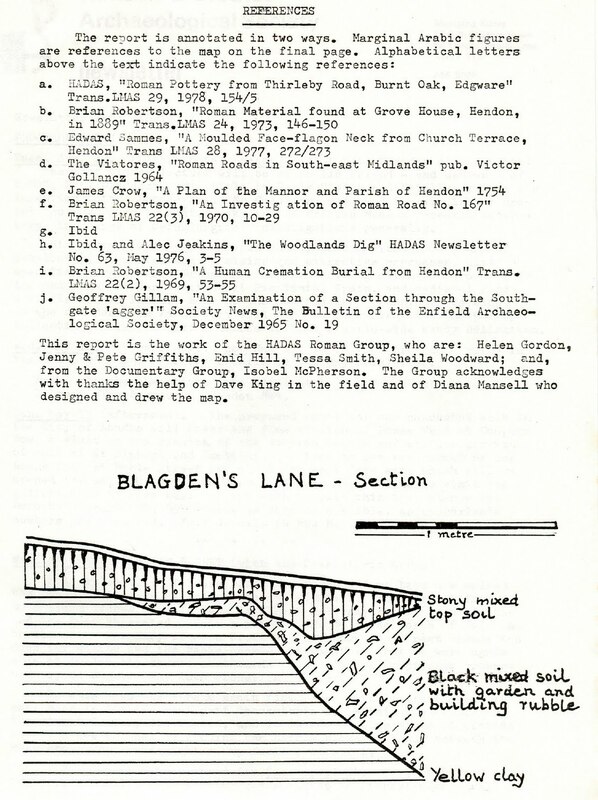 The interpretation of the sections of road uncovered in 1968 in NE Copthall Fields remains a challenge. Projecting its direction in a line NNE, a straight route could be followed up Salcombe Gardens and thence by the public footpath which emerges on the Ridgeway near Burton Hole Lane. Now the only unknown street of the seven in Hendon mentioned in early documents is Gladwin Street*; in 1635 R Nicol of Mylespitt owned 3 fields-now called 'Drivers,' earlier called 'Gladwyn Field,' Fearne Croft' and 'Long Croft.' No other Gladwin has been identified; (on the other hand, no other field bears the same name as a street). These fields (plus a fourth, 'Further Drivers') appear on Crow's map on the line of this foot­path; moreover, they lead towards the field '693 3 A by the Road.' If the road did ascend the Ridgeway by this route, it must have taken a sharp turn to continue along the ridge; but if it went straight on, what could have been its destination? *The other 6.are: 'Berwestrat/Berewrestratel (Burroughs), 'Braintstrete,' 'Dole Street,' 'Lawrence Street,' 'Page Street' and 'Parson Street'.